The waters of Lake Pend Oreille are right outside your door at this studio-style Bayview floating home, a lakefront escape with small front and back decks with a front-row seat to fishing, boating, and swimming in Idaho's largest lake! This secured floating home sits directly on the shores of Scenic Bay, a beautiful inlet in the southwest corner of Lake Pend Oreille. Bring along your rods, tackle, and hiking boots to explore the lake's 200-mile shoreline, rent a boat and boat slip from the local marina, or head three miles southwest to hike, view mountain goats and elk, and hit the beach at Farragut State Park. You'll also be just 12 miles from Silverwood Theme Park for a day of family fun, and close to local restaurants like Captain's Wheel Resort and Floating Patio! The living space has the ambiance of a charming mountain cabin, with natural wood paneling, a cozy kitchen, and casual furnishings to remind you of home. Sip your morning coffee outside on the deck as you make plans to kayak, water ski, or mountain bike, and come home each afternoon to enjoy a cold beer overlooking the lake while you grill some burgers on the electric BBQ. When you're not strolling around downtown Bayview, you can snuggle up on the sofa to watch movies on the flatscreen TV. Discover the all-seasons allure of Bayview - book today! Parking Notes: Parking available in the dirt parking lot in front of "E" Dock next to "JD's Place". Lived staying in cozy house boat! It was cute and cozy with all the amenities . 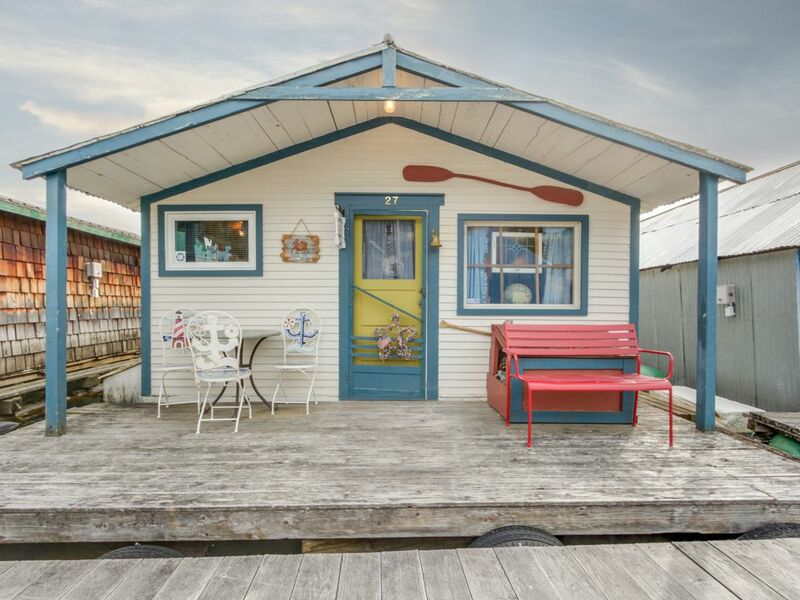 This floating home was tiny and perfect! I loved being waking up with the water view! We had a great time. Only suggestion for VRBO is better instructions. We received the info on the lock box but not enough info about the location. Each dock has a letter and we stumbled around for an hour before we showed the photo of the place to a local and they told us where to go AND unlocked the gate to the dock which was not in the instructions... other than that it was AMAZING once we found it. Comfortable, rustic and had everything we needed.